People ran away from clouds of tear gas police fired among the crowd on Taksim Square in Istanbul on Tuesday. 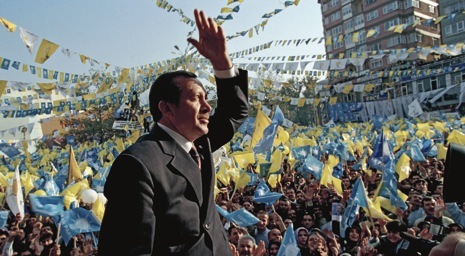 Recep Tayyip Erdoğan was elected in 2003, despite having been banned from holding office, and since then he has taken an increasingly harsh line against his opponents. In the past five years, more than seven hundred people have been arrested. Photograph by Abbas. I just noticed a New Yorker piece about Turkey by Dexter Filkins that was written more than a year ago, well before the current protest wave in Turkey. 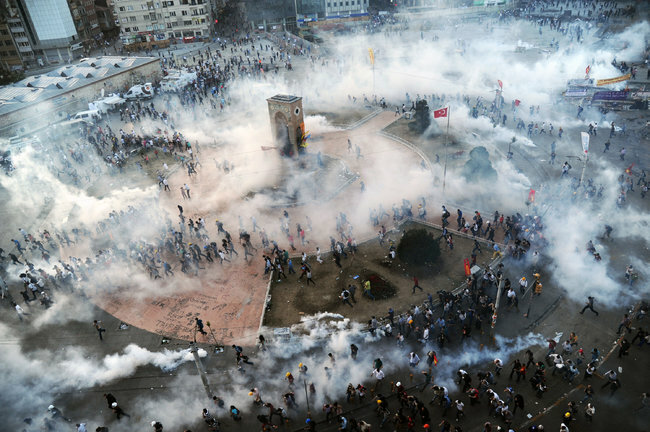 But it's one of the better overviews I've seen of the political developments in Turkey over the past decade that helped set the stage for this confrontation. Filkins focused on the prolonged and complex struggle between the newly ascendant Islamist AK Party elite, headed by Erdogan, and the old secular Kemalist elite—including, in particular, the deeply embedded framework of quasi-authoritarian institutions and arrangements, partly open and partly concealed, that Turks have long called the "deep state". The AKP's campaign to dismantle the "deep state" has some potentially valuable implications for advancing Turkish democracy, but in other respects it seems to have broadened into a more generalized campaign to suppress and intimidate all criticism and opposition, and some of the ongoing judicial inquisitions have come to resemble a McCarthyite witch-hunt. "The Deep State: The Prime Minister is revered as a moderate, but how far will he go to stay in power?" I find that pair of analogies apt and illuminating, despite their obvious limits. But as I read Filkins's account of Erdogan's career as a successful populist politician (and demagogue), it occurred to me that Erdogan also has more than a touch of James Michael Curley, and perhaps even Huey Long (though Erdogan is decidedly more pious and, as far as we know, more sexually monogamous than the latter, and of course he doesn't drink alcohol). He expresses and personifies both the status resentments of his consituency and their desires for macho self-assertion. Such are often the ways of politics in a democratic age (which are not always, in the end, fully democratic politics).